It’s said if you do what you love, you never work a day in your life. That is true for me, because I love coming to my studio in Toledo, Oregon and playing with different elements of nature printing. 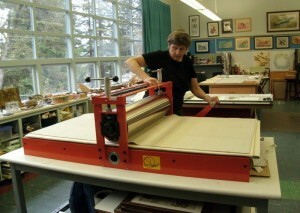 Last year I added an etching press to the studio equipment- a 30 x 60 brightly colored etching press from the Takach company in New Mexico. I call it Big Orange. I am in enamored with the way that the heavy even pressure of an etching pressure can pull out the subtleties of a nature print.